Received 14 August 2009; revised 1 September 2009; accepted 2 September 2009.
priority surveillance of human health risk. accumulated in human body and environment long-term. with little related literature reported [9,10]. 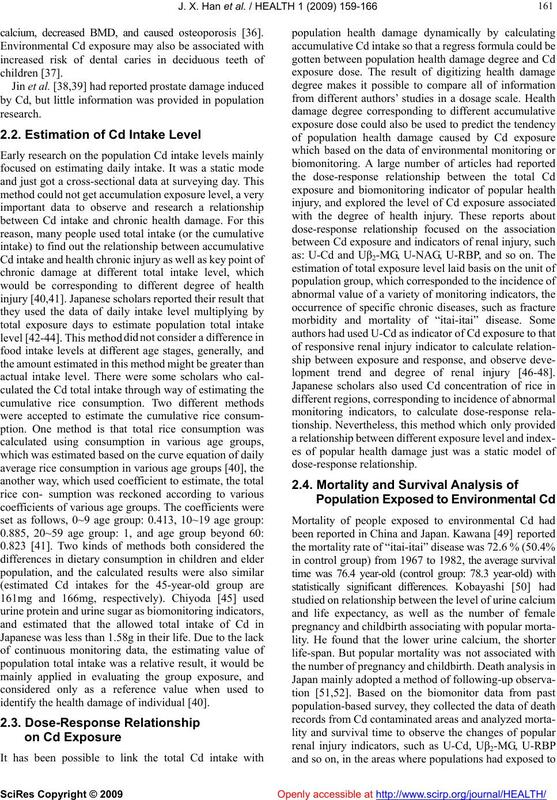 of exposure level, mortality, and survival analysis . sis in recent years in China . residents in the area from Cd health damage. environmental Cd exposure was the increase of U-Cd. 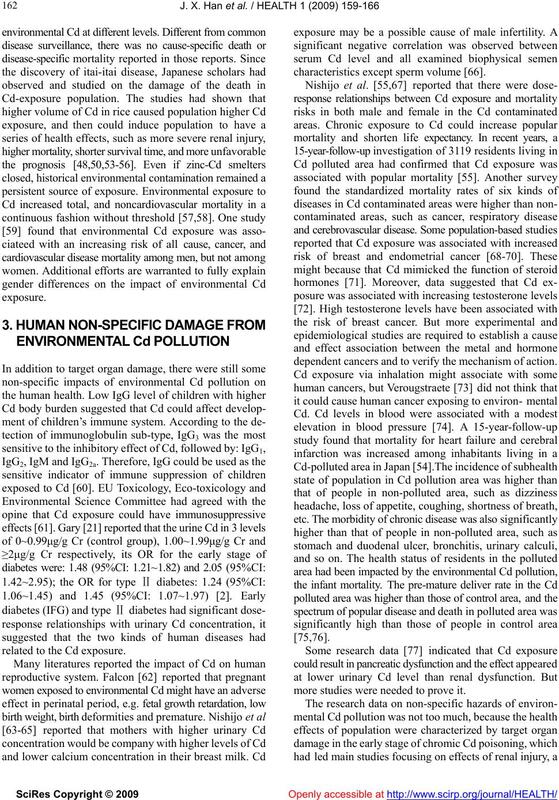 of Cd in a population with low environmental exposure. and U-ALB were expected to show a significant change. calcium, decreased BMD, and caused osteoporosis . identify the health damage of individual . lopment trend and degree of renal injury [46-48]. related to the Cd exposure. characteristics except sperm volume . dependent cancers and to verify the mechanism of action. more studies were needed to prove it. 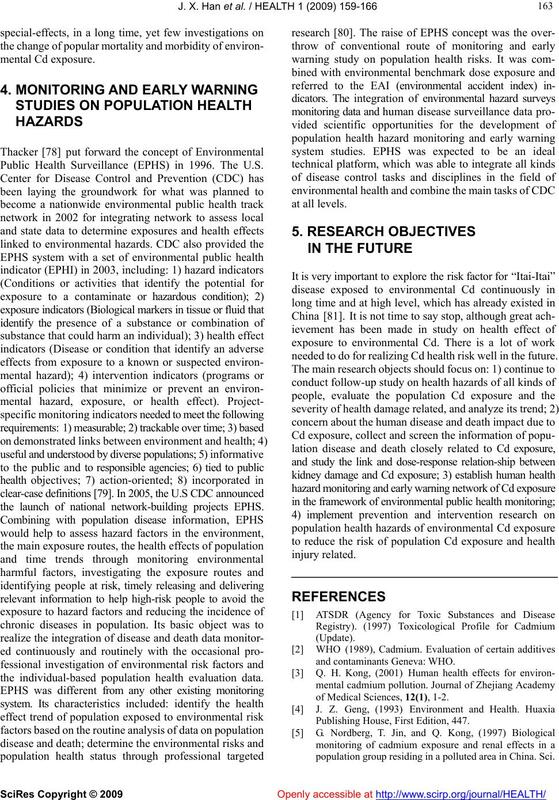 Public Health Surveillance (EPHS) in 1996. The U.S.
the launch of national network-building projects EPHS. the individual-based population health evaluation data. needed to do for realizing Cd health risk well in the future. of Medical Sciences, 12(1), 1-2. Publishing House, First Edition, 447.
population group residing in a polluted area in China. Sci. Health. 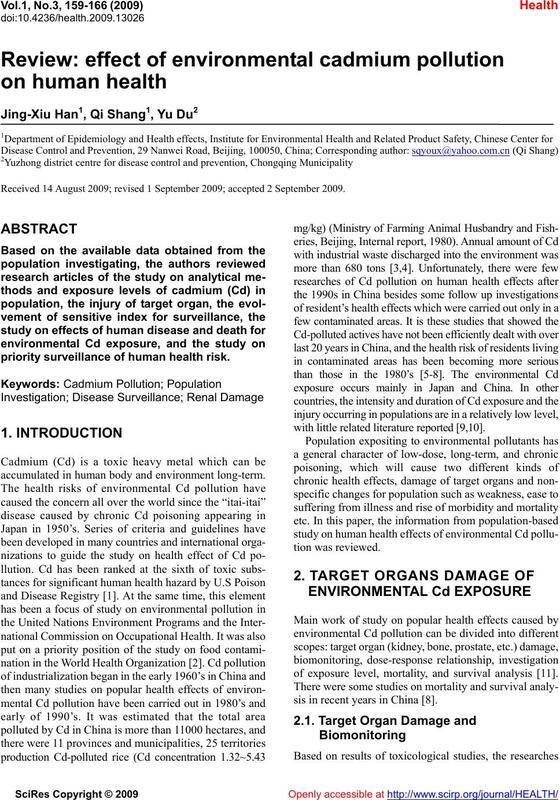 China Public Health, 17(3), 196-198.
for renal dysfunction in a cadmium-polluted area in China. cadmium. Toxicol Lett., 80(1-3), 49-54.
polluted rice paddies. Toxicology Letters, 176, 124-130. Japan. Toxicol Lett., 179(2), 108-12.
environmentally, Cadmium in the Human Environment. environmental cadmium pollution (1998) GB/T, 17221.
lation in two areas unpolluted by cadmium. Arch. Environ. in ß2-microglobulin in urine of general populations. Exp. beta2-microglobulin in urine of general populations. Tohoku J. Exp. Med., 205(3), 247-61.
humans. 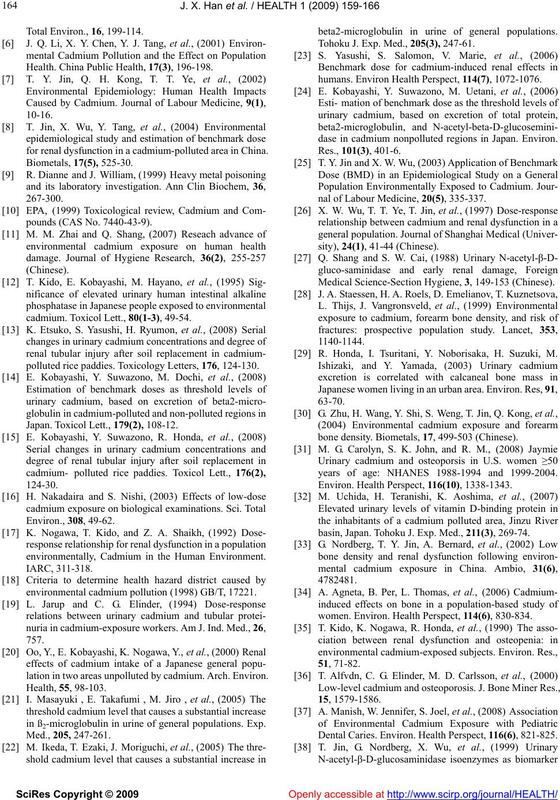 Environ Health Perspect, 114(7), 1072-1076.
dase in cadmium nonpolluted regions in Japan. Environ. nal of Labour Medicine, 20(5), 335-337. Medical Science-Section Hygiene, 3, 149-153 (Chinese). R. Honda, I. Tsuritani, Y. Noborisaka, H. Suzuki, M.
bone density. Biometals, 17, 499-503 (Chinese). years of age: NHANES 1988-1994 and 1999-2004. Environ. Health Perspect, 116(10), 1338-1343.
basin, Japan. Tohoku J. Exp. Med., 211(3), 269-74.
women. Environ. Health Perspect, 114(6), 830-834. Dental Caries. Environ. Health Perspect, 116(6), 821-825.
population. Environ. Res., 81, 167.
lations Involving the Action of Tumor Necrosis Factor. Environ. Health Perspect, 116(6), 769-776. Japan. Biolog Trace Elem Res., 89(2), 145-154. Science of the Total Environment, 308, 49-62.
from the individuals in the Jinzu river basin of Japan. Biolog Trace Elem Res., 96(1-3), 9-20.
renal biomarkers. Environ. Health Perspect, 110, 151-155. Amortality study of patients with Itai-Itai disease. Environ. basin, Japan. J. Appl. Toxicol, 22, 431-436.
basin of Japan. 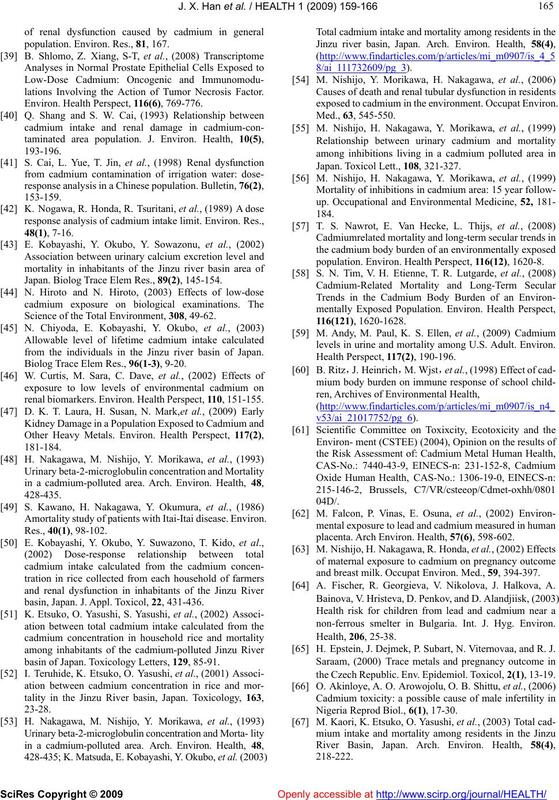 Toxicology Letters, 129, 85-91.
exposed to cadmium in the environment. Occupat Environ. Japan. Toxicol Lett., 108, 321-327.
population. Environ. 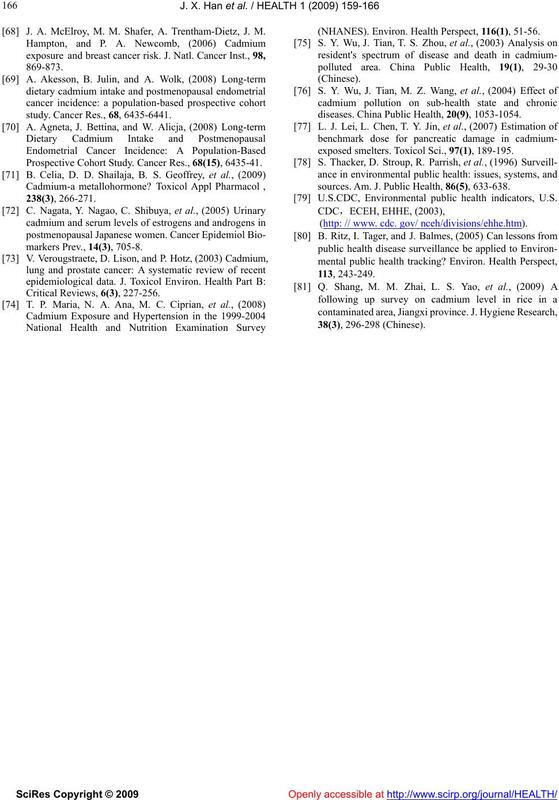 Health Perspect, 116(12), 1620-8.
levels in urine and mortality among U.S. Adult. Environ. placenta. Arch Environ. Health, 57(6), 598-602.
and breast milk. Occupat Environ. Med., 59, 394-397. A. Fischer, R. Georgieva, V. Nikolova, J. Halkova, A.
non-ferrous smelter in Bulgaria. Int. J. Hyg. Environ. H. Epstein, J. Dejmek, P. Subart, N. Viternovaa, and R. J.
the Czech Republic. Env. Epidemiol. Toxicol, 2(1), 13-19. Nigeria Reprod Biol., 6(1), 17-30. J. A. McElroy, M. M. Shafer, A. Trentham-Dietz, J. M.
study. Cancer Res., 68, 6435-6441. Prospective Cohort Study. Cancer Res., 68(15), 6435-41. (NHANES). Environ. Health Perspect, 116(1), 51-56.
diseases. 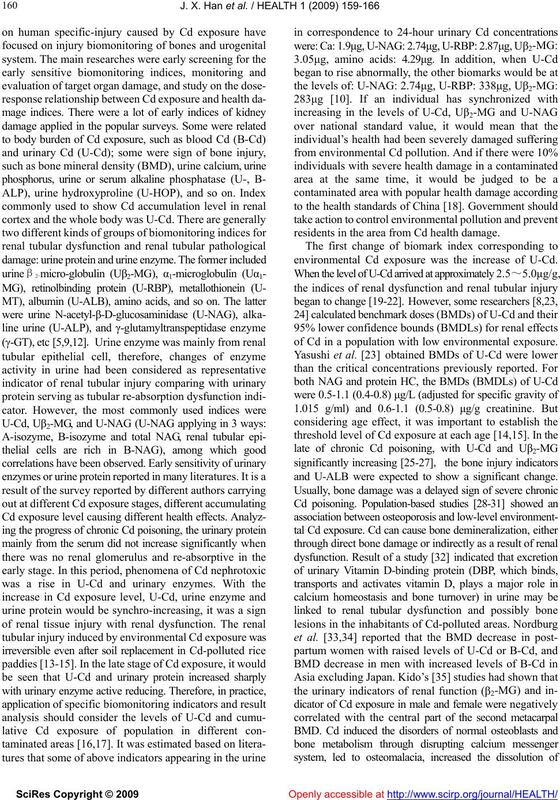 China Public Health, 20(9), 1053-1054.
exposed smelters. Toxicol Sci., 97(1), 189-195.
sources. Am. J. Public Health, 86(5), 633-638. U.S.CDC, Environmental public health indicators, U.S.
(http: // www. cdc. gov/ nceh/divisions/ehhe.htm).